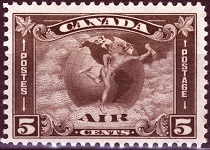 The first Canada air mail stamps appeared in 1928. The impressive first issues feature allegorical representations of flight, and the wartime issues feature the contributions of the Canadian aircraft industries. Separate postage stamps for air mail service were discontinued after 1946, and after that date, regular definitive or commemorative postage stamps were used to pay air mail postage rates. Between 1942 and 1950, air mail special delivery and air mail official stamps were also issued, but these special air mail services stamps were soon discontinued. The 5 C. denomination air mail stamp (Scott #C1) shown above, at the left, was issued on September 21, 1928. 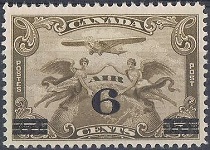 The design features an allegory of flight, being a monoplane above two victories pointing to the map of Canada on the globe below them. These stamps were first used on September 22, 1928 for the inauguration of the Toronto-Ottawa-Montreal-Rimouski air mail service. The 5 C. denomination air mail stamp (Scott #C2) shown above, at the right, was issued on December 4, 1930. The design features an allegory of air mail circling the globe, being Mercury, the messenger of the gods in Roman Mythology, running across the Earth, with the Western Hemisphere behind him. 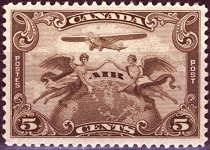 The two revalued Canada air mail stamps shown above were issued during 1932, with one being a definitive air mail stamp and the other being a commemorative air mail stamp. The 5 C. denomination air mail stamp of 1928, shown above at the left, was overprinted and revalued as a 6 C. denomination air mail stamp (Scott #C3) on February 22, 1932. 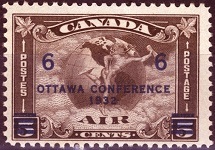 The 5 C. denomination air mail stamp of 1930, shown above at the right, was revalued as a 6 C. denomination air mail stamp (Scott #C4) and overprinted to celebrate the "OTTAWA CONFERENCE / 1932" on July 12, 1932. The British Empire Economic Conference, also known as the Imperial Economic Conference and the Ottawa Conference, was a conference of British colonies and autonomous dominions that was held in Ottawa from July 21, 1932 to August 20, 1932 to discuss the Great Depression. 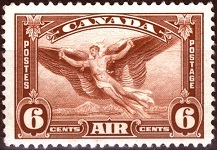 The 6 C. denomination air mail stamp (Scott #C5) shown above was issued on June 1, 1935. This design also features an allegory of flight, being Daedalus of Ancient Greek Mythology. The background, behind Daedalus shows Mt. Baker (10,781 ft.), which is in the Cascade Range of Northern Washington State (Southern border of British Columbia). Daedalus was a skilled craftsman and artist, and he was the father of Icarus. To escape from a tower, where he was imprisoned, he fabricated wings made of sewn feathers that were waxed for himself and his son, Icarus. He warned Icarus not to fly too high, because the heat from the sun would melt the wax, and not to fly too low, because the mist from the ocean would soak the feathers. Daedalus succeeded in his flight, but Icarus flew too high and fell to his death. 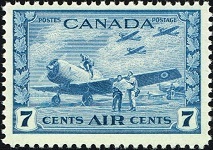 The pictorial air mail stamp (Scott #C6) shown above was issued on June 15, 1938. This is the companion stamp to the pictorial definitive set issued during 1938. 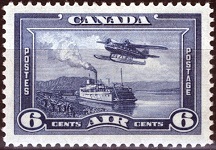 The design features a seaplane in flight, above a steamer on the Mackenzie River of the Northwest Territories. The Mackenzie River is the second longest river in North America, with only the Mississippi River being longer. 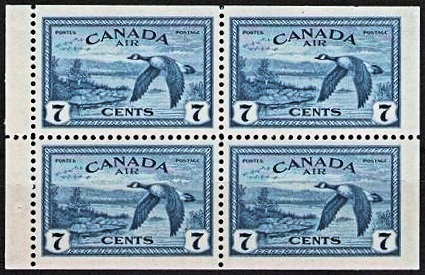 The two Canada air mail stamps (Scott #C7-C8) shown above were issued on January 7, 1942 and on April 16, 1943. These are the companion stamps to the Allied War Effort pictorial definitive stamps issued during 1942 and 1943. The design of these two Canada air mail stamps features fighter planes and student fliers. 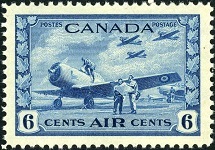 The last Canadian air mail stamp (Scott #C9), shown above, was issued on September 16, 1946. 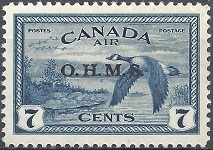 The design of this air mail stamp features Canadian geese in flight. These Canada air mail stamps were also issued in booklets. A booklet pane is shown above. 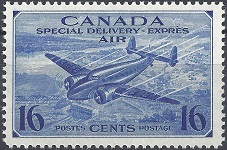 Canada air mail official stamps were issued during 1949 and 1950, by overprinting the Canada air mail stamps of 1946. The first air mail official stamp (Scott #CO1), overprinted "O.H.M.S." (On His Majesty's Service), was issued in 1949. It is shown above, at the left. 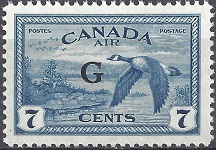 The second air mail official stamp (Scott #CO2), overprinted "G" (Government), was issued in 1950. It is shown above, at the right. The two Canada air mail special delivery stamps (Scott #CE1-CE2) shown above were issued on January 7, 1942 and on April 17, 1943. These are the companion stamps to the Allied War Effort pictorial definitive stamps issued during 1942 and 1943. 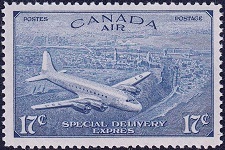 The designs of the air mail special delivery stamps feature a Trans-Canada Airlines plane and an aerial view of a city. 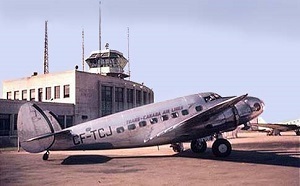 Trans-Canada Airlines operated from 1937 to 1965, when it was renamed to Air Canada. 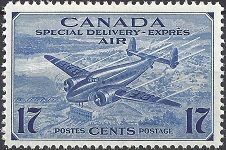 The air mail special delivery stamp (Scott #CE3) shown above, at the top, was issued on September 16, 1946. The French word "EXPRÈS" at the bottom is spelled with an "Ê" (circumflex accent mark) which is incorrect. The stamp shown above, at the bottom, was issued on December 3, 1947. On this stamp the spelling of the French word "EXPRÈS" has been corrected with an "È" (grave accent mark). 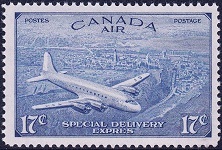 The designs feature a DC-4 Trans-Atlantic Mail Plane over Quebec.